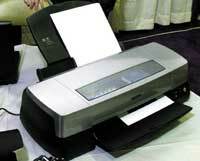 A color printer isn't the luxury item it once was at the personal, small office or workgroup level. Fewer documents these days are pure text; they often include graphics, photos or maps for which color is helpful, perhaps even essential. Fortunately, color ink-jet printers are up to the task for users who need quality color but don't have the workloads or budgets for high-volume, high-speed laser printing. And plenty of users are finding what they want in the versatility, flexibility and low price of color ink-jets. Hewlett-Packard's 2500CM is a network-ready printer with a maximum 600- by 600-dpi resolution and speeds of up to 11 ppm for black and 9 ppm for color. It's priced at $1,499. More than 19 million color ink-jets were sold last year, and sales are expected to grow at a 15 percent annual rate over the next four years to 38.2 million units in 2004, according to International Data Corp., a high-tech market research company in Framingham, Mass. Color ink-jets come in a variety of categories. Inexpensive but highly serviceable personal ink-jets may be bought for $100 or less, while the same basic machines with more speed and stronger print engines may be purchased for small office/home office (SOHO) service at prices between $150 and $250. Most workgroup ink-jets cost between $400 and $1,000, depending on the features, such as network cards, interface types and paper management capabilities. A few very fast and specialized commercial-grade ink-jets with collators, copying functions and the ability to handle wide-format paper also are available, but at prices that place them beyond the scope of this Buyers Guide. This guide focuses on an affordable range of printers that are likely to be found in a small office. They are not big'most of them load 100 sheets of paper at a time. They are not particularly fast'color output for most of them is in the single digits per minute. But many of them can print at high resolutions and are fast enough to handle a lot of tasks. Cartridges for color ink-jets can cost twice as much as those for their black-and-white counterparts, and the type of printing you do'photo reproductions, for instance'might require a more expensive paper stock. But overall, the costs of printing with this class of ink-jet are low enough to make color a practical addition to your printing output. Although the color ink-jet market is loaded with products, only a handful of companies are involved in their actual manufacture. Hewlett-Packard Co. leads the pack in ink-jet sales, with a suite of about 30 products. The company's DeskJet personal and SOHO product lines constitute the biggest portion of ink-jet sales worldwide. Its 2000, 2200 and 2500 series is the largest group of workgroup ink-jets available anywhere. Over the years, Canon U.S.A. Inc. has had notable success in the personal/SOHO ink-jet market. Its current suite of 10 models includes four portable units, the BJC-50 and BJC-55 and the BJC-80 and BJC-85. Epson America Inc.'s current suite of 14 ink-jet printers is also targeted mainly at the personal/SOHO market, with only the Stylus Color 900, 900G and 980 available as workgroup printers. But Epson's five Stylus Photo models make it the leader in the photo printer category. Lexmark International Inc., which also makes printers for Compaq Computer Corp., Eastman Kodak Co. and others, has slimmed down its ink-jet product line to seven models. But Lexmark is taking a serious run at Hewlett-Packard's leadership position. If its sales to Compaq and Kodak were counted, it would rank as the No. 2 ink-jet vendor in the United States. Xerox's networkable DocuPrint M760 has a maximum resolution of 1,200 by 1,200 dpi and printing speeds up to 12 ppm for black and 8 ppm for color. It's priced at $200. Many of the color ink-jets listed here can do double duty as photo printers, with specialized ink cartridges and photo-quality paper stock generally provided by the manufacturer. But for high-quality photographic renderings, check out the units that are specifically designed to be photo printers at maximum image resolutions of 1,440 by 720, 1,200 by 1,200 or even 2,400 by 2,400 dots per inch. Most of them include a CPU, plenty of internal memory for storing images and specialized photo editing software. The two leading ink-jet technologies offer positive benefits for cost-conscious printer buyers who want high-quality color. Thermal ink-jets pump ink into tubes within print heads that may contain up to 64 nozzles for each color. When heat is applied, tiny ink drops are applied to the paper. Piezoelectric ink-jets use crystals at the back of the ink reservoir. When an electric current is applied to the crystals, they emit tiny amounts of ink through the print head nozzles. A high-resolution ink-jet printer can produce millions of droplets per minute on the page with color shades and intensities represented by closely layered dots. The result is a photorealistic image in true color. Epson America's Stylus Photo 2000P is designed specifically as a photo printer with 1,440- by 720-dpi resolution. Resolution. Resolution, measured in dots per inch horizontally and vertically, is the main measurement of printer output quality. True resolution is the actual, unadjusted resolution'600-by-600 dpi, for example'but in most cases this is enhanced by various software techniques used to adjust or correct the edges of images, resulting in sharper pictures and text. For simple text renderings, a 300-by-300 dpi rating is perfectly acceptable. For clear graphics, you need dpi ratings of 1,440-by-720. And for photo-quality renderings, printers with 1,200-by-1,200 dpi or even 2,400-by-2,400 dpi are becoming the norm. Speed. A printer's speed, measured in pages per minute, is another indication of its capability, albeit a deceptive one. Manufacturers typically overstate the speed of their products because they run their speed tests in draft mode or by printing the same page over and over. This is not an indication of true performance potential, though you can use ppm ratings for comparison. And throw all guesstimates for photo printing out the window. Printing out an 8-inch by 10-inch glossy photograph from a 2M JPEG file can take 10 minutes or more on typical ink-jet photo printers. Media handling. Most of the ink-jets in this guide handle standard, letter, legal, executive and envelope media. 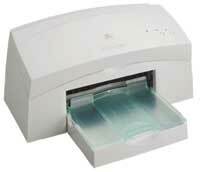 They also can print out index cards, business cards and labels. Among the printers listed here, only Hewlett-Packard's DeskJet 1220Cxi and 1220C/PS'which allows paper up to 13 inches by 19 inches'and Xerox's DocuPrint C20 and NC20'which goes up to 12.6 inches by 22 inches'are equipped to handle larger legal stock. All photo-capable printers can handle coated and glossy paper stock. Cartridge types. Virtually all ink-jet printers now use at least a four-color, dual-cartridge system for blending rich colors with millions of shades. Many new models have six-color dual-cartridge systems that further enrich the color possibilities. Photo editing software. Photo editing software allows even amateurs to cut, crop, manipulate and digitally edit photo images to exacting professional standards. This class includes Hewlett-Packard's PhotoREt, Epson's Perfect Picture Imaging System and Digital Photo Lab, Adobe Photoshop and PhotoDeluxe, Lexmark Workshop for Photos, and PhotoSuite III SE from Management Graphics Inc. of Minneapolis. Duty cycle. Always keep a printer's volume requirements, or duty cycle, in mind when shopping. An ink-jet's rated duty cycle can range from a few hundred to 100,000 or more pages per month, depending on its speed, print engine, CPU, memory and paper-handling capability. Don't expect a $99 personal ink-jet to handle thousands of pages per month without burning out. But don't buy a $1,000 networkable model for occasional use. Connectivity. Built-in or optional network cards with bundled networking software will make your printer available to multiple users on a LAN. They also will often let you manage the printer from a central console or server on the network. Network alerts are especially useful in case of paper jams or when an ink cartridge runs dry. If your operating system allows it, you also can link a personal ink-jet to two or three systems by connecting it to one system's parallel port and setting the printer as shared. This won't provide networking alerts, but it is a simple and efficient way to share a single ink-jet among several users. Ink and paper stock. Until recently, color ink-jet reproductions faded quickly, often in a matter of months under direct sunlight. Improvements in ink and ink-jet paper, however, have it made it possible for even a $400 ink-jet printer to produce images that can last years instead of months. For example, the Intellidge cartridges used in Epson's Stylus Photo 870, 875DC and 1270 photo printer series use new inks with lightfast dyes that increase the longevity of prints to more than 10 years if used with the company's premium photo paper. Hewlett-Packard in September announced a new lightfast paper, HP Colorfast Photo Paper, that provides fade resistance for up to 20 years under glass and 15 years without glass. Internal CPU and RAM. Many low-end personal ink-jets depend on the host PC's CPU and memory for storing and processing images. This approach makes for inexpensive printers but it costs you in processing power and speed. High-end printers with their own CPUs and memory can manage most printing tasks efficiently without slowing down the host device.